I dropped by the local post office this morning and waited 20 minutes in line to ascertain why they had refused delivery of the UPS 3-Day Select controller package sent to me General Delivery, putting me considerable dollars down. I showed him the label from the same vendor that they had welcomed a week ago. Their official judgement: “I don’t know.” That they refused delivery doesn’t help me, but that they can’t even guess as to why they refused really doesn’t help. That leaves me nervous about playing a rinse-and-repeat once the package shows up back in Chelmsford, Mass. Whose to say that the next attempt may not bounce, too? Without a cause identified, I’ll be playing Russian roulette with another $45 plus lose another two weeks if I lose the gamble. I don’t care who you are – that’s a lot of money. So, I went to the laundromat to ask the guy there if I could use their street address for delivery and spend the day there to intercept the UPS truck on the day that it is scheduled to show up. He said fine, but also suggested that I have it delivered UPS Will Call to their Customer Center in Blythe, CA, some 24 miles away. It’s a UPS distribution center that the package passed through on its go-around. They would hold it for my pickup, and the counter is open from just 9AM-10AM each weekday. Hmmm. I’ll talk to the controller vendor tomorrow, since the package will be back in their hands then. I’m camped on a branch off the Old Yuma Road, which now runs through BLM land. It’s a rough gravel track that now runs about 5 miles before petering out. I find it morbidly fascinating, since there’s no slight hint of paving, or even prepared foundation as a real roadway. That makes me wonder when it began its life as a connecting route to Yuma (about 90 miles away), and when another, better road took over, causing it to be abandoned. Is it just me? Following it, I found that it’s just as well that I parked where I did. Another mile or two deeper in and I’d be grounding out the trailer in the washes. These washes, or water passages, apparently see a lot of action in August and September. In fact, the original location for Quartzsite was destroyed by floods right off the bat and was forced to move to its present location. Flood warning signs are posted all over the place, even going down Route 95, and the proofs that it’s not an idle warning are frequent. It’s a different life out here, I guess. The specified water fording clearance for the Ford 4×4 is 18 inches as I recall, and looking at the details of the washes I’ve seen, I’m not absolutely sure that’s enough! 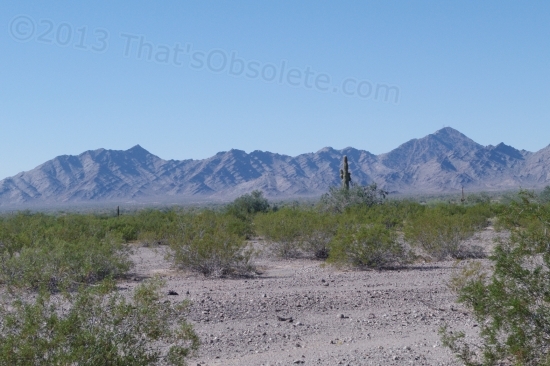 The further south one goes on the Old Yuma Road, the more beautiful it gets. I’m a bit close to 95, and the tire hiss from the larger vehicles is still audible. Down there, it isn’t, and there are many cacti down there, too. The mountain views are even better. But I prefer to stay here this year because I want to be close to town with its numerous shows in January and February, and to be assured of a solid cellular connection. I’m a newbie, playing it safe. 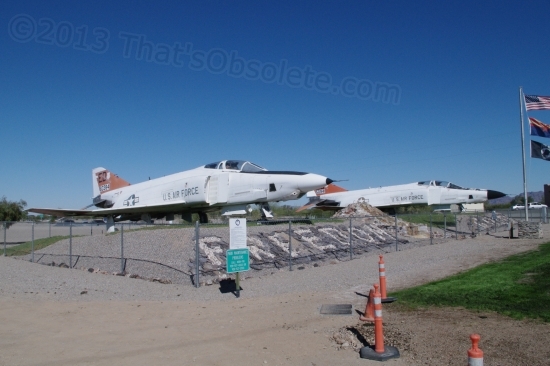 While trying to find the one pharmacy in town (part of a medical clinic), I stumbled across two Vietnam-era F-4 Phantoms perched high in a park. How did they transport these things here? The sign on the chain link fence proclaimed “Quartzsite Garden Club Project”, and each plane was positioned on a mound of gravel with a front of carefully-placed pile of rocks, of which there are oodles of them around here. I know, because I have to dodge them every time I choose to drive or bike. I think there must be half a dozen plants that can grow here. The rest don’t stand a chance.